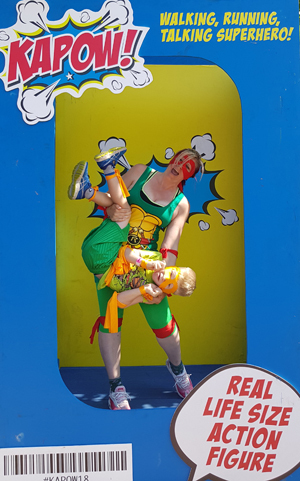 How did I train for the 5k superhero fun run? 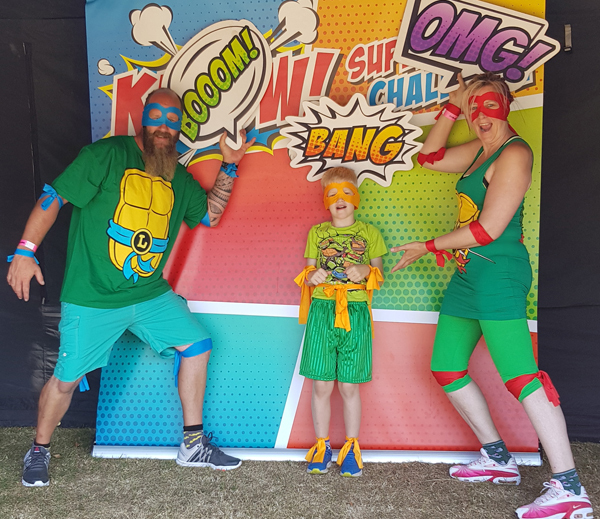 Well, the simple answer to how I trained to complete a 5K superhero fun run - I didn't! I know how that sounds, and I promise you I'm not bragging, what I actually did was ignore the fact I was doing it! In March I wrote how I'd inadvertently signed my family up for a 5K fun run. I didn't realise it was 5K, I just assumed we'd go there and have a load of fun on a load of inflatables because let's face it, that in itself is knackering! It was when I told my partner that I'd done this, he did the sensible thing and read up on what exactly the Martlets Superhero KAPOW event was all about! I remember vividly him telling me it was a 5K run! Then trying to explain to me how far 5K was! I haven't run since I was a teenager so of course, I needed to train, and I downloaded the 'train to run a 5K' app and used it 2 days in a row. Then I just ignored the fact I was doing this! Fast forward to Monday before the race and I accepted that I needed to now have a contingency plan as I had not trained and we are in the middle of a heatwave. The plan was to let my partner run around with my son and I'd just wonder behind them. And that's pretty much what I did! I know how bad that sounds! I'm totally ashamed of myself and as you can see, I don't have the body of a runner, I don't have the stamina of a runner and I should have trained for 4 months to pull off this event properly. But I didn't. I have HUGE body issues and being in a tight dress and leggings in bright green for all to see was not one of my finest moments, added to the fact I'm not fit enough to run a 5K was enough to make me die a little inside. I pushed ALL of that to one side for one day. I put my big girl pants on and sucked it up because, at the end of the day, I did this so my son has fun memories of his parents. I did this so we had a fun as a family, and as my kid is 6, he doesn't care that his mumma has lumps and bumps in all the wrong places, he loves me for me. 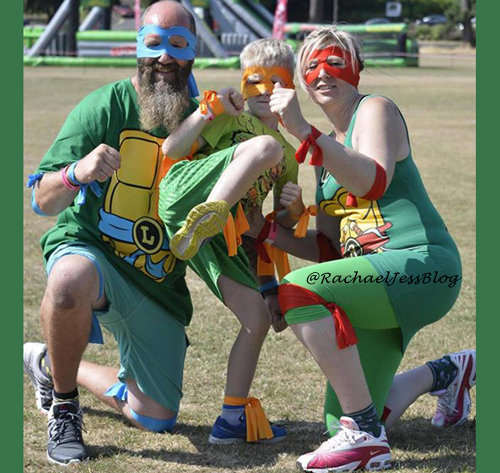 At 6, it's all about the Teenage Mutant Ninja Turtles, bouncy 20 foot high inflatables, and his mumma's dress riding up around her neck as she goes down a slide! I hope my son had a lovely day, he seemed to be in his element. I really enjoyed myself too, the foam inflatable being my favourite, although I did lose him in there it was so high! AND what's more....... I want to do it again next year!!! 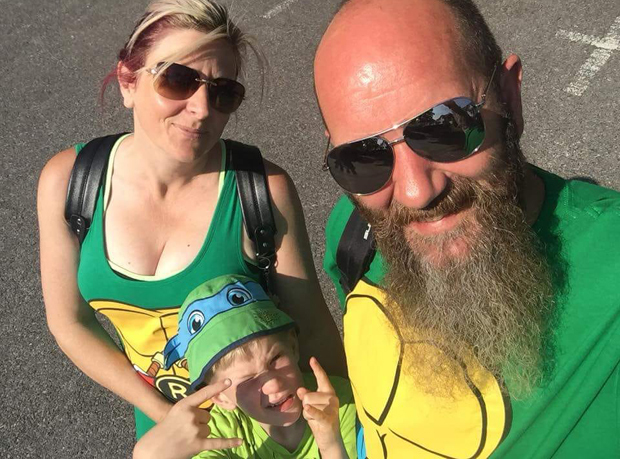 Feel free to sponsor the crazy TMNT family, it'll spur me on to train and enter again in 2019. It looks like you had a great time! And anyone can be a runner! Doesn't matter what body type you have. I love your costumes too! OH wow, well done you. I rather enjoyed the mad inflatables. I'd like to get back into running, but I just can't find the love for it at the moment.